The Tweed Run has launched a striking collection of limited edition bespoke cycling products in collaboration with internationally renowned brands including Savile Row tailor H Huntsman & Sons, Rapha and Brooks. With tweed suddenly back in vogue, and fabric and style sported by Matt Smith’s Doctor Who, the Tweed Run hopes that the collection will find the fans among men and women it deserves. The collection includes a complete tailored cycling suit, flat cap in reflective weave, leather shoes, hand-carved leather saddle, knee-length socks to go with a pair of tailored Plus-Twos, while accessories count a silk scarf and hipflask. The Tweed Run is a social bicycle ride through London streets on April 10 with all riders sporting tweed 1920s and 30s cycling attire. The day involves leisurely riding in the company of fellow ladies and gentlemen dressed in plus-fours, Harris tweed jackets, merino wool team jerseys, silk cravats and jaunty flat caps. The ride will benefit Bikes4Africa, a charity that provides quality, refurbished bikes to African secondary schools along with training to maintain their bikes. H Huntsman & Sons special edition Tweed Run Cycling Suit. As the most famous address on Savile Row, Huntsman has been trading since 1846, each year commissioning a limited edition ‘house tweed’. For the Tweed Run cycling suit, the cut is based on a traditional Huntsman shooting suit with the house’s famous broad shouldered single button, single breasted silhouette with nipped waist. Made by their expert tailors, in your choice of archive house tweed and featuring a pure silk lining of the Tweed Run bicycle pattern. Available in made-to-measure and bespoke options. 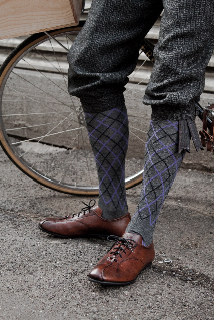 Tweed Run knee-length cycle socks by Rapha. Rapha is synonymous with high quality and this collaboration does not sway from the course. Soft, top quality merino wool knee high socks with a modern interpretation of an argyle pattern rendered in black and heather. The colour combination was chosen to match the Tweed Run house tweed design, but also pair well with denim. Tweed Run Flat Cap in collaboration with Dashing Tweed. More refined than a traditional cycling cap, these caps are designed for cycling featuring a deeper back panel for a firmer fit and a slightly elongated brim to keep the rain off. The cap is hand sewn in Yorkshire using a luxurious wool twill print with the bespoke Tweed Run design and material woven by Dashing Tweeds that incorporate reflective stripes that illuminate at night when in car lights. Tweed Run Silk Scarf. Pure silk scarf with the Tweed Run bicycle pattern by illustrator Michael Chapman. This silk scarf will make your outfit – whether worn around your neck in 50s randonneur style or in the breast pocket of your jacket. The scarf has been cut and edged by hand. 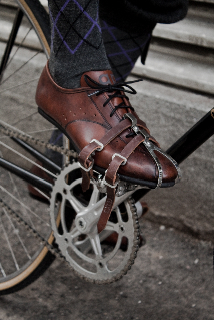 Tweed Run Sprinter Shoes by Quoc Pham. Gorgeous handmade sprinter shoes that are as functional as they are beautiful and designed with a sole that’s stiff enough for cycling yet comfortably soft for walking. Handmade using carefully selected vegetable-tanned leather and traditionally hand-polished to create a deep antique cognac patina, before being finished by rubbing with many layers of beeswax to seal. The final touch is the printed insole featuring the Tweed Run bespoke bicycle pattern. Tweed Run Pewter Hipflask. The flask is entirely handmade starting life in Sheffield as two flat pieces of dull pewter, which are shaped, then etched with the Tweed Run bicycle design before being joined and hand-polished to a brilliant mirror finish. The flask is 4 oz and comes in a presentation box, making these great gift items. Tweed Run Custom Brooks saddle with design by Kara Ginther. This three-way collaboration has produced a very special saddle that will compliment any bike. The saddle is a copper-riveted Brooks Swift saddle hand-carved by American leather artisan Kara Ginther into a tweed herringbone pattern using skivers and scribes. A real work of art. Tweed Run Plus Twos in collaboration with DS Dundee. Beautifully tailored Plus Twos – like Plus Fours, but reaching two inches below the knee instead of four to create a more tailored look – and in the reflective Tweed Run house tweed. Fully designed for cycling, they feature fantastic details like a reinforced seat and pockets designed so that contents won’t escape when cycling. Horn buttons and lining are of Savile Row quality and made by a character of a man in a suitably archaic factory in deepest north London.